"If things weren't bad enough, I had blood in my stool and writer's block. The blood didn't concern me, but the writer's block, well that was another matter." With the exception of the L.Q. Jones 1975 Harlan Ellison sci-fi classic, A Boy and His Dog, most movies with talking pooches are geared towards kids, and generally feature cuddly comic moments, wacky hijinks, lovable antics, and plenty of "awww, that's cute" moments. Be warned that writer/director Steve Cuden's Lucky is most definitely not one of those, and while it is certainly very funny at times (in a demented kind of way), it deals with a dark, violent subtext that is thankfully played mostly for grim laughs. Michael Emanuel stars as schlubby Millard Mudd, an out-of-work cartoon writer whose lonely life seems to center mostly around excessive drinking and beer-induced philosophizing; his home and yard are nearly knee-deep in empty beer cans, he suffers from writer's block, and he yearns for the affections of a mysterious dream girl he knows only as "Misty." His life takes a giant leap toward the dark side during one of his frequent late night drives to the liquor store when he accidently runs over a small dog named Lucky with his car. While lamely trying to nurse the dog back to health at his home, Mudd discovers he shares some type of telepathic link with his new pal, and Lucky (voiced by David Reivers) doesn't just talk, but acts as a sort of all-controlling muse. Pretty soon new cartoon ideas are flowing (dictated by Lucky), but through the dog's prompting, Mudd even eventually develops a relationship with Misty (Piper Cochrane), his secret fantasy. Ah, but with all that success comes a price, and in Millard Mudd's world it turns into a yard full of dead bodies. Even with all the increasingly murderous situations in Lucky, much of the material seems to have been written as a twisted comedy, at first at least, until the Steve Sustarsic script crosses that invisible line where things suddenly aren't necessarily all that funny anymore. For me, maybe it was right around the time Mudd started dabbling in necrophilia that laughing seemed less appropriate, despite some great dialogue (a real constant throughout Lucky), all delivered with a casual deadpan by Michael Emanuel as the tormented cartoon writer. The film is a little uneven in spots, not uncommon in low-budget flicks shot over nine days, but its saving grace lies directly with Sustarsic's talkative script, much of which consists of narration by Mudd, such as his wonderful ramble about the meaning of life that takes place during Lucky's opening moments. The over-the-top, purely comic nature of some of the events in the film (Mudd's terrible dates, or his prolonged fantasy about murdering Misty) are overshadowed by some decidedly more brutal elements in the final half hour; even a talking dog has trouble softening up the rough edges. But, like a car wreck, it is tough to look away, and it does feel rather weird laughing at it. On just about any given day, I'm all about sick and twisted when it comes to movies. Lucky, however, doesn't quite bring all the elements together as tightly as I would have liked (some sequences seem almost too silly), though Michael Emanuel is fun to watch as shows he has the ability to glide from quiet exasperation to brutal murder in a heartbeat. Image Transfer Review: Lucky was shot on high-end digital video, and as a result the 1.85:1 nonanamorphic widescreen transfer looks particularly good. Image detail is strong, as are the color and black levels. Some light grain and a bit of digital artifacting, most noticeable during the outside night shots, is evident in some sequences. Audio Transfer Review: Audio is presented in a no-frills, front-channel only 2.0 surround mix, with dialogue sounding clean and hiss-free. There are some instances of directional pans that manage to fill out the soundstage somewhat. Nothing flashy, but nothing to complain about. Extras Review: Director Steve Cuden provides a full-length commentary track, and he talks not just about the usual things directors talk about on such tracks (shooting schedule, locations), but what makes the best onscreen vomit (vegetable soup). Cuden has a lot to say about the production, and the informative track is structured nicely; he even offers up his own interpretation of the film's ending. The disc is cut into 20 chapters, and includes cast and crew bios, five trailers, and optional Spanish subtitles. 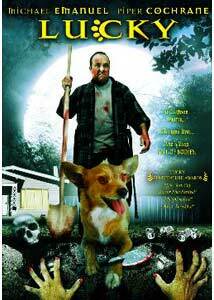 Steve Cuden's film about a talking dog, dead bodies buried in the backyard, and a murdering cartoon writer is an uneven little black comedy that throws out brief bits of uncomfortable ugliness (murder and necrophilia) with some great man-driven-to-the-edge humor. If you like 'em way left of center, this one might be worth a rental.